The Car GuideTests and FeaturesTest Drives2012 Hyundai Veloster: Doesn’t the name imply velocity? 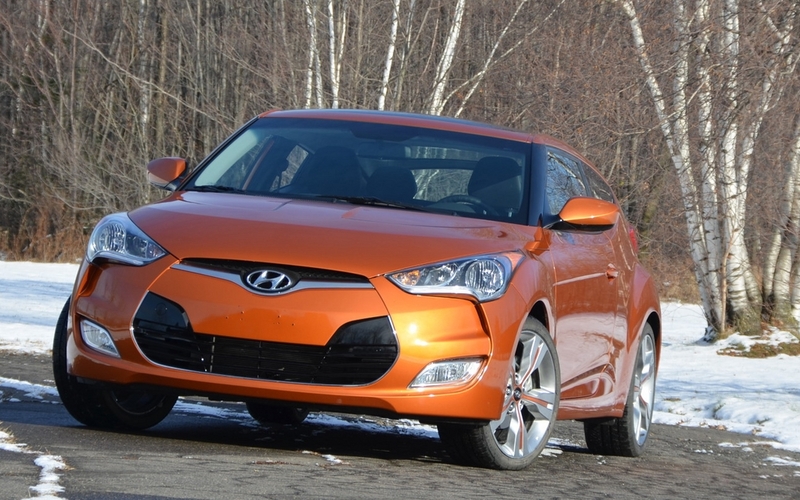 2012 Hyundai Veloster: Doesn’t the name imply velocity? At the 2012 Montreal International Auto Show, Hyundai lifted the veil off the 201-horsepower Veloster Turbo for the first time in Canada. And although I haven’t had the chance to test it yet, I can confidently confirm that this Veloster can finally be proud of its name. But let’s be frank. The regular Veloster doesn’t offer much velocity. Its 1.6L four-cylinder engine may be modern and feature direct injection, 138 hp and 123 lbs.-ft. of torque, but it doesn’t exactly propel the vehicle to the speeds you might expect given the Veloster’s exterior lines. That said, the Veloster came out at the top of its class at the most recent AJAC (Automobile Journalists Association of Canada) trials. This category included the Buick Regal GS, Honda Civic Si and the Volkswagen Jetta GLI – not what you’d call slow cars. Did this pretty hatchback from Hyundai really deserve to take home first place? The Veloster is built on a modified version of the Accent’s platform. A few years ago, the mere thought of creating a sporty vehicle with a sub-compact platform like this one would have people laughing in your face. But given the Accent’s exceptional success, it seemed a smart choice for the Veloster. The suspension is good, but it has trouble dealing with unexpected bumps – just like on the Accent. The steering is reasonably precise and offers decent feedback. All four wheels feature disc brakes whose performance is about average. And yet, despite being the sum of such humdrum components, this vehicle is actually quite lively. The Veloster is a lot of fun to drive, even when you take it past the legal limits on the track. Body roll is well controlled and drivers will quickly come to appreciate the car’s agility. A shame the seats don’t offer much lateral support. The Veloster may be a sound vehicle, but its 138-hp engine just doesn’t do it justice. Given that it takes 9.7 seconds to go from 0-100 km/hr, this car won’t be striking the fear into any drag racers’ hearts. Its pick-up is much the same and the car seems to have trouble increasing its speed as it comes out of corners, no matter how hard you push your foot on the pedal. But at least this lack of power doesn’t generate any torque effect in the front wheels as you accelerate. Major plus: The interior soundproofing is very good, which means you don’t have to listen to the engine as it groans in protest. The Veloster is equipped with a dual-clutch automatic transmission, just like the very best sports cars. But if no one had told me, I never would have guessed it. Since the automatic gear shifting is just OK, the paddle shifters behind the steering wheel may entice you to opt for manual shifting. The model we tested came equipped with 18-inch wheels, which seemed a little big for the car. Not only will these cost you more to replace, they’re hard on the engine. The bigger the wheels are, the harder the engine has to work to initiate movement – especially when the engine isn’t very powerful to begin with. To compensate, engineers often shorten the distance between the lower gears, but that doesn’t seem to have been the case in this car. During our week-long test drive, we recorded an average fuel consumption of 8.4 L/100 km, which is substantially more than the 6.1 L promised by Hyundai. I’d have to say that 8.4 L is probably a more realistic figure, considering that the engine has to work so hard all the time. Fortunately, the Veloster weighs less than 1,300 kg, which increases its agility. Oh yeah, you can always set it to “Eco” mode, but since that reduces the engine’s power (and therefore your fun), we only used it a couple of times – and mostly because we are conscientious journalists. Otherwise, I’m not sure we would have even bothered. Despite its reluctant engine, the Veloster is pleasant to drive and stands out with eye-catching style. Hyundai designers didn’t want to produce a mere cross between a wagon and a traditional hatchback, so they added a second door to the vehicle’s right side – but not to the left side! This isn’t the first time in history that a car has had asymmetrical sides. For example, the hilarious Pacer built by American Motors in the 1970s featured a longer door on the right side than on the left. And though there are certainly more examples we could name, let’s get back to the Veloster. It’s extra little door may have been added to make accessing the rear seats easier, but you still have to be something of a contortionist to get into the back. Once you’re in and you’ve got the door closed, you feel a bit like a dwarf due to the fact that the beltline is so high. Overall comfort is decent, but anyone taller than 5’6’’ may find their hair getting mussed. Up front, things get a lot better. The dashboard is attractive and all the controls are easy to find, except the “Eco” button, which is hidden behind the steering wheel. (Maybe they did that on purpose?!) Most of the materials are good quality, the dials are easy to see and read, and the steering wheel offers good grip. The seats are comfortable and heated. But it almost goes without saying that rear and three-quarter visibility are terrible. Good thing a back-up camera is included factory-standard. Our test model came with the Technology Package, which included a GPS, better quality sound system, leather accents, etc. With all this equipment, our Vitamin C-coloured Veloster (I didn’t know that Vitamin C had a colour) cost $25,509. If it were up to me, I’d forgo the Technology Package and save myself $3,500! On many levels, the Veloster is a success. But if it really wants to live up to its sporty exterior, it needs more horsepower. The turbocharged version we were promised at the Montreal Auto Show should fix this problem. I just hope that the Hyundai engineers calibrate the suspension for a sportier ride and equip the car with seats that offer better support on turns. 6/10	Will its resale value be high or low?